← But is it Real Picadillo? You may remember that several months ago I raised that question, and in a partial answer, I began baking some Bahn Mi rolls made with a portion of rice flour in the dough. At the time, I was not impressed with the results, and vowed to continue the experimental bakings to find a more acceptable baguette. The baguettes of Saigon are legendary and we know that they contained some rice not only because we assume that wheat flour was an expensive commodity, and rice was common and cheap, and so it is likely that they used as much rice as they could in the baguette dough – we also know this because the Vietnamese bakers of the time have told us so. And although I have searched for such a classic French/Vietnamese recipe on the internet, I have not found one. I found plenty of Vietnamese baguette recipes that contain rice flour, and it was one of these that I used for my bakings. But the recipe I used -with 27% rice flour- did not produce a satisfactory baguette – my guess is that the lack of gluten results in a crumb that does not hold together well, and a crust that, although soft, does not have a chewy texture at all. This does not make for a good sandwich experience. At first I thought this was strange – how could the French bakers in Saigon allow something as poor as this to be made in their bakeries? And how could anything like this become legendary? And the more I thought about it, the more I suspected that perhaps the rice going into the bread was not rice flour, but cooked rice! I knew that cooked rice often found its way into multi grain breads, so cooked rice in bread was not unique. But would that make a difference? For my most recent bake, I decided to revisit the challenge, and test the cooked rice theory – but of course, I couldn’t just use the same recipe as in my last rice flour baking (nothing like comparing apples and oranges, right? ), it’s just not my style. And since everything I’ve baked lately has been sourdough, I adapted the new recipe to a sourdough leavening as well. 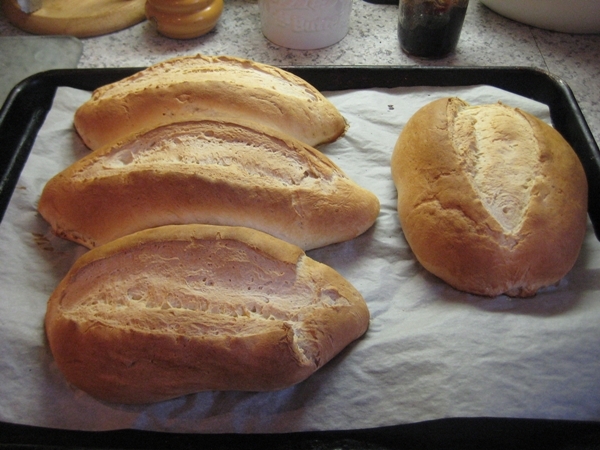 The resulting loaves – I made them more like large rolls than baguettes – are perfect for sandwiches, with a soft but chewy crust, and a velvety crumb that did not break up as it had with the rice flour bread. The taste was delightful. As you’ll note, I still used a half cup of rice flour, but my next bake will eliminate the rice flour completely in favor of a full cup of the blended cooked rice – can’t wait to try that. In the meantime, I’d like to suggest that the following recipe will make a quite satisfactory Bahn Mi baguette. Although I know there are many Bahn Mi shops that are baking their own breads, I’m not sure how many are bothering to use a traditional Vietnamese baguette made with rice, but I’d hope there are some who’d value and honor the tradition enough to bother. But the beauty of baking your own breads is that even if few others are baking a particular type, a home baker can enjoy breads that simply are not obtainable commercially – and how neat is that? * Cook 1/4 cup of leftover cooked rice, mixed with 1/2 cup of water, until the rice is very soft but still soupy – cool. * Puree in blender until smooth – set aside. Allow the levain to stand on the counter, covered, at room temp for 8-12 hours, or overnight. Using a stand mixer, place the levain from above into the mixer bowl. Add 4 Tbs. sugar and 2 tsp. salt. Add 2 cups of soft white flour. Using the mixer’s dough hook, mix at a slow speed for three to four minutes – the dough should pull away from the sides of the bowl – if it does not, add 1 Tbs. of flour at a time until it does. On the other hand, if the dough seems too dry, add 1 Tbs. of water at a time until the dough feels soft and elastic. Since this is a relatively low hydration dough (62 %), it should not require any additional flour, but it may need some additional water – play it by ear. I think the rice acts quite differently than the wheat flour when hydrated. Allow the dough to rest for 10-20 minutes in the bowl, covered. Continue to mix with the dough hook for five to seven minutes – give the dough a window-pane test to assure gluten development. Remove the dough to a greased bowl, and allow to proof at room temp for one or two hours – when the dough is pushed with a finger and the hole remains indented, remove the dough to a bench to form into loaves or rolls. Divide the dough into 4 oz. pieces (for small rolls), or 6-8 oz. pieces (for small baguettes). Allow to rest for 10-15 minutes. Take each piece of dough and flatten into a small rectangle (twice as long as wide) – roll into a tight cylinder and roll on the board until it has stretched out by 50% – now, using your two palms, roll the ends of each cylinder into tapering points – flatten each roll a bit and remove each to a greased baking sheet. Baguettes are formed in a similar manner, but the ends are not tapered to a point. Cover the baking pans and allow to proof for another hour or two (rising time with sourdough always differs depending on many factors) – the rolls/baguettes should double in size when ready for baking. An hour before baking, begin to heat your oven to 400F. Once your rolls have risen well, using a lame, sharp knife, or a razor blade (I use a box cutter), make a single cut lengthwise down the roll – a lengthwise cut looks better on a smaller size roll – you may choose to give the larger baguettes the traditional 3-5 cross slashes, depending on how long your baguettes are. You may spray your rolls with water before or during early baking, if you choose – the added moisture will add a crispness to the crust, which may, or may not, be preferred – your call. Slip the baking pan into the hot oven and allow the rolls/baguettes to bake for 20 minutes, at which point you should test them with an instant read thermometer – I like 205F plus for an internal temp – some go even higher. If your oven tends to have hot spots, as most ovens do, you may do well to turn your pan(s) half way through baking. When done, remove from oven and allow to cool on a rack on your counter before removing from the pan. If you want your rolls to be even more attractive, you may want to sprinkle them with flour, or brush them with warm milk, after they are fully proofed but prior to slashing – but I think they are pretty just as they are with further adornment. I’ll be sending this to Susan at Wild Yeast for the next round of Yeastspotting. Lot’s of great breads show up there weekly – check it out. This entry was posted in Baking, Food and tagged Bahn Mi rolls, rice flour in bread, rice in bread, sourdough baguette with rice, sourdough Vietnamese baguette, Vietnamese baguette recipe, Vietnamese baguettes, Vietnamese French bread. Bookmark the permalink. congrats to your success and perseverance! indeed the perfect vietnamese baguette is quite elusive! Great looking baguettes. I love the nice crumb! I’m glad you did this. It makes so much more sense than the rice flour. Why would those bakers go through the extra step of milling the rice flour when it is easier and more economical to just toss some cooked rice into the mix. When I made my brown rice rolls, I put the cooked grain in whole, the rice stayed very intact, I bet the nice starchy blended white rice melted down in your rolls which is good, it keeps the whole rice from cutting up your gluten and probably gives them an imperceptible chewyness. Nice! Thanks for stopping by and commenting – I’m not done with these yet; it’s fun when each iteration just gets keeps getting better. Hey Doc- Nice baguettes- that last pic with the ham is to die for. I’m not quite as sophisticated a baker as you are, but I aspire to be. I figure I’ll master the basics, then try more complex recipes. I’ve got the Bread Baker’s Apprentice and have actually read most of it. My problem is patience-I lack it. So I find myself making quick and easy recipes. Winters here aren’t as severe as they were 20 or 30 years ago. This one was pretty mild, chalk that up to Al Gore. Nice to meet you-great blog! Take care-I’m sure we’ll talk again. Oh, BTW- F-Troop was a great show! Yeah, when you start reading bread books for pleasure reading, you’re a baker. You need to get a sourdough going, that’d teach you patience! Have you done the Leahy, 1/4 tsp yeast/16 hour rise bread yet? That was an epiphany for me. The crumb looks great, very tender. I will play around with this blended rice idea, maybe it will help me to get the kind of fluffy texture into my rolls I always try to achive! Let me know if you see improvement – all of us just want to build improvement into our breads, right? I really like how this has challenged you to look back into history and try to figure out how the bread was really baked then. These look great! Should I ever make banh mi, this is the recipe I will use! 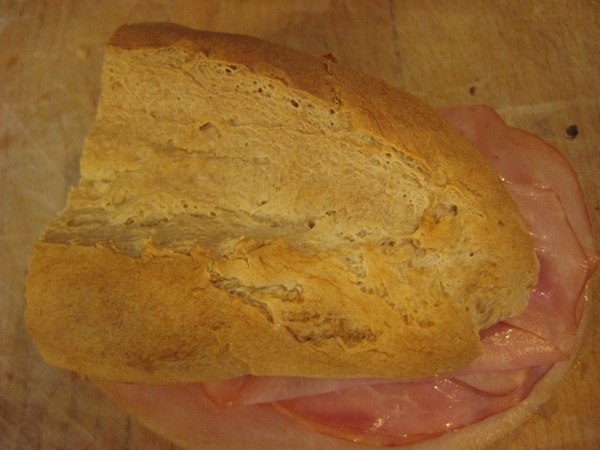 I used the blended rice Idea now in one of my roll recipies and get beautiful baguettes with a nice open crump. Thank you for the great idea! How do you make sourdough starter as mentioned in your banh mi recipe? I wonder if I could get it from the shop or some where. Thanks for stopping by – making a sourdough starter is really quite simple – mix together flour and water until it’s the consistency of pancake batter – put it in an open bowl and let it sit on your kitchen counter for up to a full week – stir often, and add more water if it starts to get dry. You will see a “false” bubble activity on day 3 – just ignore that, and just wait until more bubbles appear on day 6 or 7 – that’s the real bacteria and fungi getting nice and healthy! and put “sourdough starter” in the search box – there’s a lot of good bakers there who are glad to share all the fine details of creating a starter. Good luck and good baking! Can I ask how long can I keep those sourdough starter for if I’m not using it all? If you could please post a basic sourdough bread as I am also a fan of this kind of rustic bread very much. Short answer- store it in the fridge or freeze it. Long answer- sourdough is only good for bread baking as long as it’s active and healthy, and as long as it’s in the fridge or freezer, it’s not active and healthy! And it takes at least three days out of the fridge for a starter to come back to good health. I bake maybe once or twice a week on average, and I seldom, if ever, put my starter in the fridge/freezer. and spend some time soaking up some knowledge there – there are 100s of sourdough recipes there. I have just baked a batch of banh mi using your recipe, I just used active dry yeast as I just couldn’t wait a week long to make sourdough starter. The bread rolls are very nice and crusty. The texture wasn’t the same as the rolls from Vietnamese bakery. It does look and taste like baguettes that I had in Paris apparently. I ended up having them with my pumpkin soup and it was yummy. Thank heaps for your recipes and I will try to make it with your sourdough starter next time. Dr, it seems we have the same irritating habit…I’ve been trying to figure out the Vietnamese baguettes off and on for about two years now. All the “traditional” recipes I could find on the net called for a teaspoon or so of baking soda in a dry-yeasted bread. I found that baffling until it dawned on me that the originals were probably made with starter of one sort or another, and the hot Vietnamese climate could easily lead to high enough acidity during a long rise to cause gluten issues–and gluten would be an issue already, with that nagging (but presumably cheaper) rice flour in the dough. In a sour-fermenting dough rather than a modern dry-yeasted one, a little soda would not only help keep the acid within a manageable range, but would possibly contribute a little extra rise to what could easily be a too-dense bread. From that thought, a Google search led me here. Thanks for the ideas–I’ll be incorporating your cooked-rice mash into my evolving recipe. Hope my little insight may be useful for you as well. Much thanks for the twist – I’ll sure try it. And please let me know how your next tries turn out – I’d also be interested in the recipe you’re using. I think my starter tends to suffer from acidity at times, so your comment is especially interesting. I never got notice of your last comment – sorry! I’m very glad you got a chance to try the recipe – thanks for your interest and comments. Your baguettes look great! 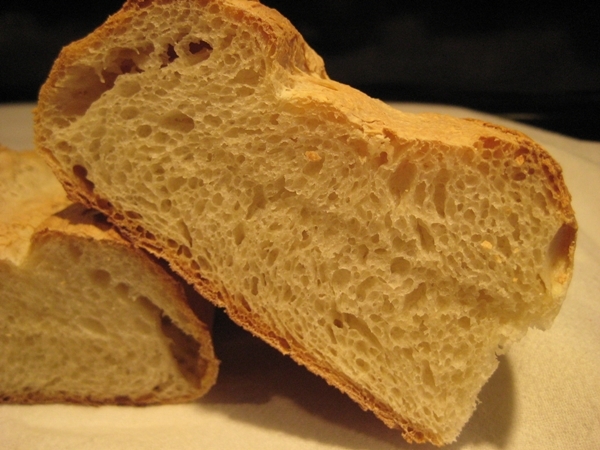 As a Vietnamese, I can tell you that only wheat flour is used in our breads. It’s almost the same as French bread making but with a different rising technique. VB, Any chance you could share the details of the different rising technique with us? Not so.. At least not so for me. I’ve been making sourdough for years. (buttermilk starter) & I always keep my starter in the fridge. Somtimes it’ll sit in the fridge for months depending on personal circumstances. If I’m going to make my bread again, I take my starter out of the fridge early in the day, sometimes mid day, give it a good stirring, pour off just under half, feed it, and its ready to go the next morning. Can’t recall ever having to wait 3 days for my starter to be active again. Not unless I go back 20 odd years ago when I first mixed the starter. Thank you so much for sharing your recipe with us. I was looking for Vietnamese Baguettes Recipe. I’ll try yours recipe soon. Take care. WOW! Thanks for the post. This is amazing! Thanks Nancy – here’s hoping you have a super Thanksgiving. Hey dr, would you by any chance be able to give any tips on converting this recipe for dry yeast? I am a pretty inexperienced baker. Easy, Mike! Since a 100% sourdough starter is just 50% each of water and flour, all you have to do is add a 1/4 cup of each to the flour and water in the recipe + the amount of yeast you wish to use.- and I’d use a very small amount of yeast (1/4-1/2 tsp) added to the levain and be sure to give it an overnight in the fridge – the next morning, take it out and form the rolls, and let them rise at room temp. Or you could just throw all ingredients together at one time, and use 2 tsp of yeast! Your pick. Hi Mr. Drfugawe, I did not use cooked rice and my bread is very airy, very similar to the bread that sold on the streets in Saigon, Vietnam, except mine has thick crust, and there is no cracks around it. May be I over baked them. 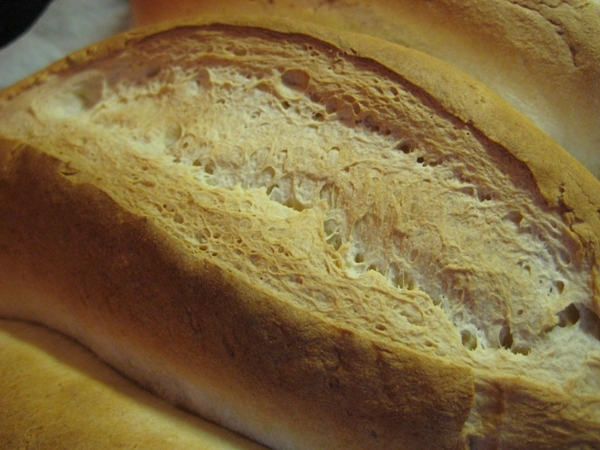 Do you have any trick how to make the bread has golden color, thin crust, and crack? Thank you. Try adding as much steam to your oven during baking as possible – some ways to do this are: placing a heavy pan in bottom of oven while preheating oven, and then toss in a few ice cubes (or a cup of water) during baking – or spray oven with a mister when the rolls are first put in and again at 5 minutes into the baking – you might also try misting the rolls prior to putting them into the oven. Adding moisture is a way commercial bakers use to create a thin crust. To add more golden color, you can paint your rolls, prior to slashing, with either milk or a beaten egg. Good luck, Michele. Positives: nice thin crust, soft over all from out side to the inside. Negatives: no cracks, too dense, no big holes, not airy, nothing like yesterday bread. Could it be too many of these? put in the oven, on the bottom rack a bake pan with water to create steam plus brush the bread with a beaten egg then mist the bread pior to slashing then in the oven at 500 F. Then 5 minutes later I sprayed the bread again and again at about 2 -3 minutes and lower the temp to 450F. Very difficult to judge a bread, or an effort, via a few comments. Your best result will come from first, using the recipe as it is written, and then baking the bread multiple times, each time making only one change. That way you can track the ‘why’ of your results. If you make multiple changes in the bread each time you bake, you’ll never be able to figure it out. Sorry, but good bakers often bake the same bread 100s of times before they really get it right. I don’t use a machine, so I’m reluctant to say ‘sure’, but why not give it a try – and let us know. Thanks for stopping by. Although I’d love to say Yes, I doubt you’d find any similarity – this recipe is one I came up with on the hunch that since rice was more common in SE Asia than wheat, perhaps rice might have been used for baguettes in Vietnam after the French left there – but as you’ll see from a few of my commenters, this is probably not the case. Sorry. I think the method of rolling makes a big difference as well. The rolling of the Vietnamese baguette is different than the French. They take the portioned dough, slap it hard onto the counter until it stretches very thin, then roll it into a log. I suspect that by doing this, it produces a thin crackly outer crust when baked. Oh, that’s interesting! I shall give that a try, as long as I can remember it when I next do some baking. Thanks – The only thing I’ve found that gives a thin crispy crust is to bake them with lots of moisture in the oven – but then, once they’ve been out of the oven for an hour or so, the crust gets softer. I’ll try your idea. Sorry for the long post (below)…..the first video shows how the dough is “beat” to shape the loaves. I’m thinking the minimal mixing and no kneading help the bread in the tenderness aspect. I am going to make some tomorrow and I’ll let you know how it turns out…. I have been looking for a recipe and I found this translation and videos online…I’m not sure who to credit them to as I saved it to my computer a month ago. “In my search for making Vietnamese baguette, I appreciated everyone effort for trying to seek out the true recipe. Like many of you, I have tried several recipe with different degrees of success and failure. I ran into this video, which seems to be the real deal. It is in Vietnamese, so I will write out the recipe. let formed dough rise for 45-60mins at ambient room temperature. longer for cold climate and shorter if you have a proof oven. – For 2.5 cups flour + oil + salt left in the bowl enzyme was incubated, stuffing mix and flour, while the local stuff that is sticky, soft for remaining dough very slowly until you see enough then stop more flour (purpose leaves 1/2 cup flour and add slowly to the soup powder moisture). Stuffed flour until the Department of powdered plastic ball enough toughness is ok. Bring powder put into a container have smooth 1 thin layer of cooking oil, the powder in a container large to local raw powder coat one layer of oil (dough will not dry incubation), closed out in a warm place for about 1 hour powder will float twice. – Get local flour a handful of long and divided into three parts, shaped into small round lumps of flour and then cover again let dough rest for another 5-10 minutes. Get Department of flour to roll up rolled thin and light to, eyelid dare bread and edit the desired shape => put bread on the tray using a damp cloth or nylon closure incubated for another 45 minutes. – Open the oven to 460F on the bottom of the oven free 1 tray (and prepared 3/4cup boiling water). – When the oven temperature was close enough, then used a knife slitting the cake => use a brush to dilute salt water onto the first cake layer => remove the tray groove in the middle of the oven, then quickly thrown cup of boiling water into the tray not have been prepared, and then shut the door immediately to let steam escape (this time is defined temperature). – Bake for about 18 minutes to find gold surface. Remove the cake use consecutive basting brush onto the cake 1 layer melt butter (not spread too much bread will be human and not crispy). I was so much frustrating with my result and never get the right shape and crust and airy baguette. I even travel to Vietnam and cambodia to see this baguette. They were amazing and great fr sandwich. you need a strong mixer that to mix the dough at high speed to form the gluten quickly. grease all the balls with butter and cover for 15mn to rise a bit. Ps: shaping is the MOST IMPORTANT to make this baguette. look at video above and follow the shaping….and bake with steam oven at 200cilicius. If you you use a Cuisinart,(I have one) When do you put the dough in?, when do you pulse & for how long? and when you run it “ON” and for how long approximately? After you use a fist to punch down the rising dough ball, you knead for 3 to 5 mins. by hand or by the Cuisinart? and for how long ? Do you use the plastic dough blade of the metal cutting blade of the Cuisinart? I tried to use the Cuisinart once using another similar recipe, the machine wanted to stop, the dough even leaked out at the bottom. I had to quit. Maybe I ran it too long? I will try to do it with your recipe if I can master this machine. Sorry I posted it on the wrong page. So disregard please. Minh cung tap lam banh mi o nho de an voi bo kho.